The Elgato Stream Deck is an easy to use tool for streamers that will change how they stream. 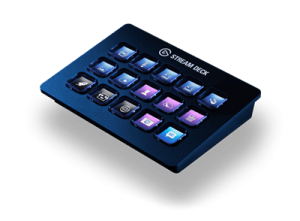 The Elgato Stream Deck is a must for streamers. There is just so much Use the Elgato Stream Deck to switch between scenes, stop audio, Tweet, control Twitch and much, much more. 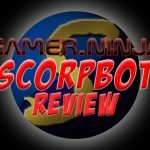 Welcome to the Video Game Product Review section here at Gamer.ninja. The Elgato Stream Deck is the latest streaming related device released by Elgato. Elgato has become the staple in streaming related products. Elgato is best and well known for their video capture devices such as the HD60 Pro and the HD60s. Elgato’s capture cards, both external or PCI, are used by both novice and profession streamers. 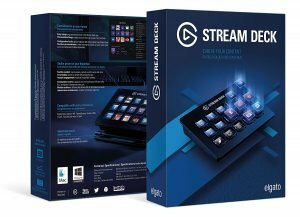 Elgato has taken things further and released a new streaming broadcast helper control device called the Stream Deck. The Elgato Stream Deck is essentially a numeric keypad with a dramatic twist. It’s actually made with streamers in mind. This is not just a remapped numeric key pad. The Stream Deck is a solid piece of streaming hardware. It has 15 customizable LCD keys that are capable of 210 programmed actions. It weighs in at less than 7oz and fits nicely in the palm of your hand. It connects to your PC via a 3’ USB 2.0 cord. It also comes with a stand that allows it to be propped up verses lying flat on a surface. It’s MacOC 10.11 (or later) and Windows 10 (64 bit) compatible. The Stream Deck’s overall size is 4.6”x3.3”x0.8”. Elgato has assembled an app called Stream Deck. 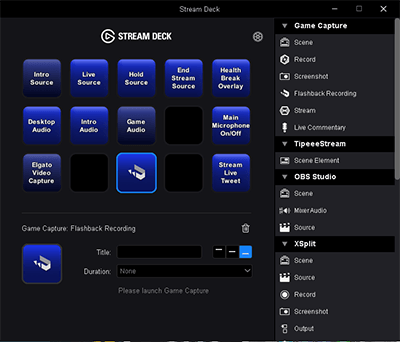 When you first open your new Stream Deck, the second thing you will want to do is download the Stream Deck app from Elgato. The Stream Deck app is pretty easy to master. The app consists of a UI that is identical to the Stream Deck itself. You pretty much click, hold then drag and drop the feature you want to the key location of your desire. After the changes are competed using the Stream Deck app, the configurations ate instantly changed. The Streamer Deck will go live as soon as the Stream Deck is updated. 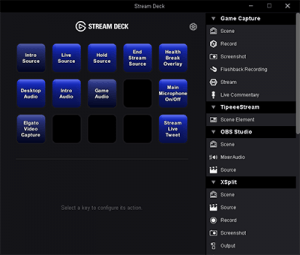 Elgato has put together a great Quick Start Guide that details all of the Stream Deck’s configurable options. Gamer.Ninja live-streams on Mixer.com. His channel is @GamerNinja. For his live video game streaming setup, the Elgato Stream Deck has filled a very sizable void. My main power horse streaming PC is located across the room. What this meant was every time a scene change was needed (basically prior to the Stream Deck we never did them) or when going live or going offline, he had to get up and walk over to the PC to do these actions. This caused “dead air” and was a huge hindrance during his streams. The Elgato cured this. It was hooked up to a 20’ USB 2.0 cord and he can change scenes and start/end his stream from his Humanscale chair. 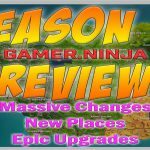 GamerNinja gives the Stream Deck 4 out of 5 star review. Because of some minor, but significant, issues found, the final score is 4 out of 5 stars. Some of the issues are easily adapted to and others would require a redesign. The textile LCD keys press nice and smoothly. The problem is they seem to push just a little too smooth. There is not “click” to let you know if the key has been successfully pressed. Once and awhile a feature does not activate because the key was not successfully pressed all the way down. This has lead into no vocals during stream or an overlay not being brought up when desired. Issue Number Two: The USB cord length. The cord is barely 3’ long. The USB cord is permanently attached and un-removable or changeable. The cord is so short that you may experience cord related issues with the Elgato Stream Deck even if you have it right next to your computer. Issue Number Three: At the time of this article the Elgato Stream Deck does not have or support Mixer.com pre-built hotkeys like it does for Twitch.tv. No future forecast has been given about Mixer.com integration. Issue Number Four: There is no support for OBS classic with the Stream Deck. A vast majority of streamers still us OBS classic. I love my Elgato Stream Deck, and have absolutely no concerns with it to date. The chances of having to contact Elgato’s support and help area with Stream Deck concerns are far and few between. Just as I recommenced my Xo-Seven Turtle Beach headset years ago, I highly recommend the Elgato Stream Deck. Most of the concerns we found will be corrected over time. Even with the above issues found, we love the Elgato Stream Deck. It will be used every day and our customization with it will continue into the future. The Elgato Stream Deck is the perfect companion for any live streaming influencer or video game streamer. The configurations are endless and the unit is built very durable. Every serious video game streamer should own the Elgato Stream Deck. Gamer Ninja gives the Elgato Stream Deck Five Stars and recommends to purchase Elgato Stream Deck.